Janet Mason writes regret with power. Whether this arduous journey is before or behind you, you'll recognize the visceral fear of loss and the longing for peaceful passage. This was aired on This Way Out! Click here to hear the entire broadcast!! 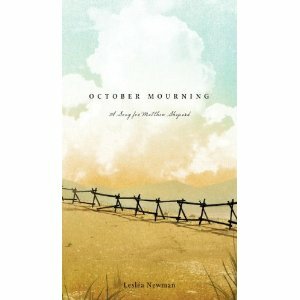 When I picked up Leslea Newman’s newest book October Mourning: A Song for Matthew Shephard (Candlewick Press), I could not put it down. Matthew was a 21 year old student at the University of Wyoming, who on October 6th, 1998 was lured from a bar by two young men, savagely beaten, tied to a fence on the outskirts of Laramie, and left to die. One of the last things that Matthew did was to attend a meeting of the University of Wyoming’s Lesbian, Gay, Bisexual, and Transgendered Association. The group was planning its Gay Awareness Week activities for the following week. Leslea was the keynote speaker. The author of many books, Leslea is perhaps best known for her book Heather Has Two Mommies – first published in 1989 to national scorn and acclaim. She is also known for her short story “A Letter to Harvey Milk,” a 2012 selection of the New York Musical Theater Festival 2012 Next Link Project. “Sorry Boy” starts out with a quote from The New York Times that the judge rejects “Gay Panic” as a defense. but that someone wasn’t you. October Mourning: A Song for Matthew Shephard is written as a world – in which we see the stars scattered above Matthew “unable / to/ help/ being / light / years away.” It addresses the question of how such a heinous crime can happen. And in the Afterword, Leslea asks the reader to think of one thing to do to end homophobia and to do it this week. October Mourning is a strongly evocative and powerful collection of poetry. Part of my own response to it, no doubt, comes from my memory of the murder of the young gay artist Anthony Milano who lived in the same town where I grew up and was murdered (under eerily similar conditions) in 1987, more than a decade before Matthew Shephard was murdered. Unfortunately, Matthew was not the first person to be murdered for being gay and he wasn’t the last. But, for whatever reasons, Matthew Shephard stands as a symbol. Leslea Newman opens his world to us –under the wide Wyoming sky – in the pages of October Mourning: A Song for Matthew Shephard.